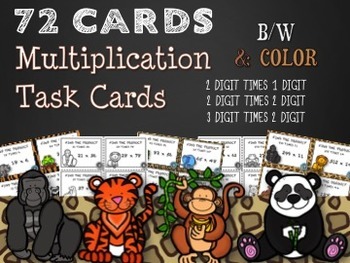 Multiplication Task Cards comes with 72 different cards each with a different multiplication problem. The cards are organized into 3 sets of 24 cards. 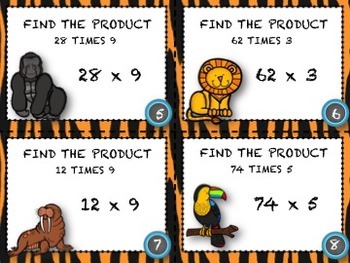 Set 1 (24 cards) - This set has 2 digit times 1 digit problems. Set 2 (24 cards) - This set has 2 digit times 2 digit problems. Set 3 (24 cards) - This set has 3 digit times 2 digit problems. For printing connivence, each of these card sets comes in both color and black and white! 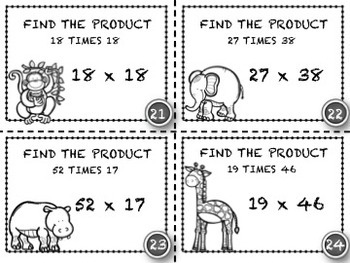 Perfect for math centers, small group instruction, remediation, extensions, class review, test prep, or a fun round of SCOOT, these simple task cards will be the perfect addition to your math curriculum. I hope this year is the most SUPER year yet for you and your students! NEED BACK TO SCHOOL IDEAS? TRY THESE GREAT RESOURCES! All About Me (Task Cards) - Getting to Know the SUPER in everyone! LOVE TASK CARDS? 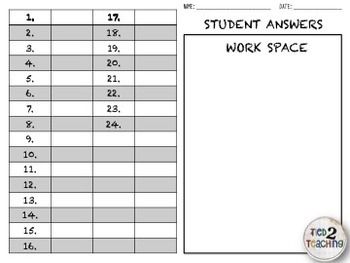 Check out these great TASK CARD resources! WANT YOUR STUDENTS TO WRITE WITH A SMILE? TRY WACKY WRITING! GET WACKY WRITING RESOURCES HERE!! !